Made a mess in the kitchen? 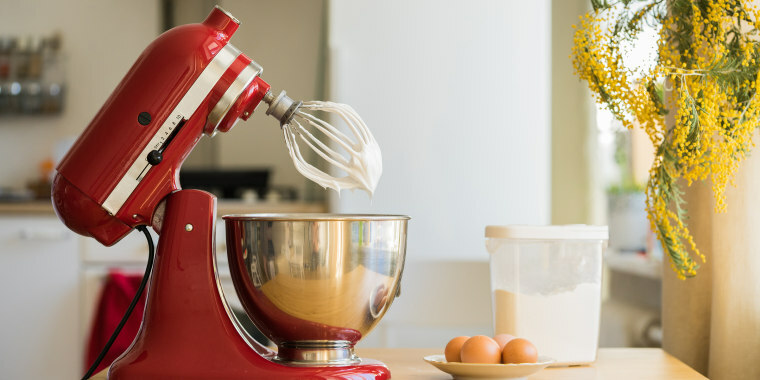 Here's how to make sure your stand mixer is clean for next time. We love our stand mixer but, all too often, our idea of cleaning it is limited to washing the bowls and beaters. What about the rest of the mixer? It deserves some TLC, too. Here to share her own cleaning regimen for a stand mixer is cleaning coach Leslie Reichert. You’ll be surprised at how many nooks and crannies there are to clean! As soon as you’re finished mixing with these items, fill the bowl with water and soak the attachments while you’re frosting cupcakes or spreading meringue. When you’re ready to clean up, either rinse the bowl and the attachments and load them into the dishwasher or wash them all in hot, sudsy water, rinse and dry completely. Check the owner’s manual for washing instructions for specific pieces. The body of the mixer is ground zero for flour, powdered sugar and whatever else goes into the mixing bowl, so it should be wiped down after each use. A more detailed cleaning, as follows, should be done once a month or as needed, depending on use. As always, follow manufacturer’s recommendations for cleaning. Wipe the mixer head with a damp microfiber cloth. (Don’t use too much water or it can get into the motor.) To remove old or stubborn marks, add some baking soda to the cloth. Use a dry toothbrush or toothpick to loosen and remove caked-on material along the ridges of the mixer head and in the vent holes in the back. Wipe clean. Check out the speed control knob and any exposed screws. Use a toothbrush to loosen and remove stuck-on food. To reach those tiny ridges, use a toothpick. When finished, wipe with a damp cloth. Tilt the mixer head back to clean the underside. Use a toothbrush on hard-to-reach areas, including the beater shaft. Wipe. Check out the bowl-clamping plate at the base of the stand. It’s a natural place for drips to accumulate. Wipe with a damp cloth and use a toothpick to clean around the outside of the rim. Lay the mixer on its side and wipe the underside of the stand. Probably, the foot pads will need a good scrubbing. A toothbrush does a great job here. Finally, inspect the electrical cord and wipe off any debris. But, of course, do not wet the plug. Now your mixer’s ready for your next culinary creation! This article was originally published on Dec. 7, 2017.